which all the external advantages of wealth, splendour, and nobility, cannot obliterate. It is consistent neither with learning nor true civility. Dogs have been a part of human society for more than 10,000 years. They have worked with and cooperated with humans throughout this long history. A culture that would discard this sacred bond and reduce a dog to a bit of tasty flesh. indicates a profound inability to understand the meaning of friendship. While it is inconceivable that a civilized person would kill a dog for any reason, the Chinese have taken slaughter to a level beyond horrific. In the elusive effort to obtain an even tastier bit of dog flesh, they have developed techinques of slaughter, raised to a level so depraved only the most degenerate would endorse them. To insure that these techniques are documented, so they may be carefully followed, there are books and videos with specific instructions on how to properly torture a dog to death. Livestock sections of large bookshops stock books and VCDs on dog farming which promote horrific slaughter methods, in the misguided belief that the more the dog suffers the better the meat will taste. Consequently, vacuum packed and canned dog meat are becoming increasingly available in some supermarkets. Not only dogs, but every animal in china may be subjected to similar treatment in the effort enhance flavor. For example the top half of a fish is wrapped in a dampcloth, as the fish is placed, still living, into hot oil. The intention is to keep the fish alive as long as possible while he is fried. The one exception to the wanton cruelty is the panda, whose life is measured by the millions of dollars it brings when loaned to foreign zoos. The act or process of civilizing or reaching a civilized state. Cultural or intellectual refinement; good taste. A human society that has highly developed material and spiritual resources and a complex cultural, political, and legal organization; an advanced state in social development. The undercurrent of horrific violence to animals in china precludes the possibility that china will ever reach a civilized state. Nor does China meet the cultural prerequisite of highly sipiritual resources required to attain an advanced state of social development. Rather, there is a total lack of spiritual awareness illustrated by the assault on the harmless, the weak and the best friend a man ever had.. Surely there is no good taste in the gruesome slaughter of a dog. Moral refinements are virtually non-existant and impossible in a value system that so callously contrives methods of torture for the pleasure of a bit of dog meat. By every standard of civility and culture China falls short. A civilization built on a foundation of ignorance, cruelty and sang froid does not have the potential to develope and grow into a mature culture. It is anything but a civilized force to be respected and emulated. The only recourse available to those who understand and appreciate the bond of friendship between man and dog, is to stop funding the killing machine. Any item purchased, that is made in China, adds to the sense that they may carry on as they choose without remorse or contrition. In a nation devoid of compassion and civility towards living creatures, the only negotiable currency is the withdrawal of cash. Boycotting China is not a dauntless effort. Germany makes excellent nail clippers. If you must buy something made in china, have it be second hand, so that there is no profit in it the second time around. 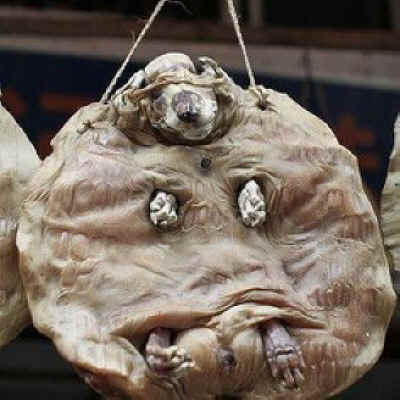 Please take a moment to reflect on the poor souls who are baked alive in china...For them: say no to China. Say no more. We will not buy your blood-drenched products. We will not tolerate the cynical and fiendish betrayal of our loyal and devoted friend.